When you’re looking for family-friendly trips, the first things that pop to mind are zoos, aquariums, and children’s museums. While you can certainly find all of those things in Chattanooga, sometimes it’s also nice to get outside and explore what nature has to offer. There are plenty of outdoor experiences to enjoy in and around Chattanooga, but here are four that no family member will ever forget. Just minutes from downtown Chattanooga, Lookout Mountain is the perfect destination for out-of-the-ordinary experiences. 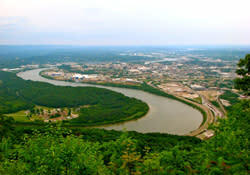 The mountain rises above Chattanooga like a sleeping giant, and two rock outcroppings, Point Park and Sunset Rock, serve as perfect destinations for a scenic view of the city and beyond, stretching to include Georgia and North Carolina. You can drive to the top to enjoy the views, but it’s also fun to hike to the top Lookout Mountain on trails that are suitable for older kids. Start at the upper or lower parking lot of historic Cravens House, the only remaining Civil War era structure on the mountain. You have three trail options from there—a 1.1-mile trail to the top, a 1.3-mile trail, and 1.5-mile trail. (Remember to double the mileage for a round-trip.) You’ll find excellent views along each route as well as the scenic payoff at the end. Keep in mind that these trails entail good bit of climbing, so the car may be a better choice for younger children. Also located on top of Lookout Mountain is Rock City, a grouping of maze-like rock formations in addition to gardens with more than 400 native plant species. It’s also known for its panoramic view of seven states that can be spotted in clear weather. 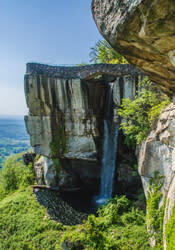 Located 1,700 feet above sea level, Rock City also includes a 100-foot waterfall that’s visible on the side of the mountain. You’ll find more amazing views while crossing the Swing-A-Long Bridge, which spans nearly 200 feet. The Fairyland Caverns feature sculptures depicting some of the most famous European fairytales and folklore, and the Mother Goose Village offers more scenes from classic nursery rhymes. For kids interested in nature, don’t miss the bird of prey show. Plus there’s a 25-foot climbing wall for those kids with any energy left. 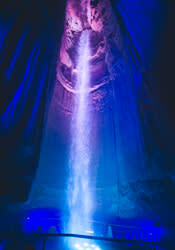 Discovered in 1928 by Leo Lambert and a team of excavators, Ruby Falls is a 145-foot waterfall located 1,120 feet below the surface of Lookout Mountain. A guide will take you into the cavern by elevator and lead you along a paved, level pathway. You’ll find unique cave formations to explore, and the sheer beauty of the sparkling waterfall never fails to impress. After the guided tour, relax on the mountainside deck with a snack and enjoy the panoramic view of Chattanooga and the Tennessee Valley below. For younger children, there’s also the Fun Forest play area to enjoy when you’re once again above ground. 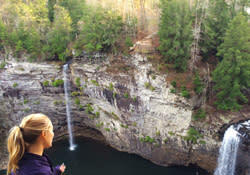 Just an hour from Chattanooga sits 26,000 acres of pristine wilderness. The Fall Creek Falls State Park is a paradise of towering waterfalls, cascades, rhododendron tunnels, streams, deep gorges, and virgin hardwood forests of oak, hickory, hemlock, and poplar. 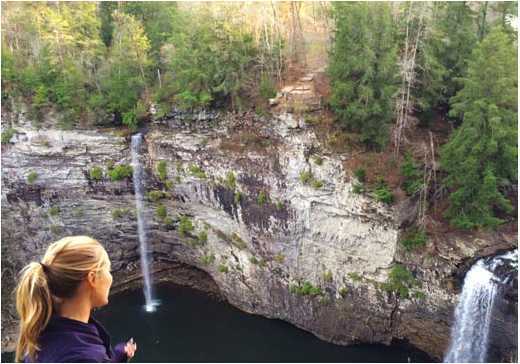 The 256-foot Fall Creek Falls—the tallest waterfall east of the Rockies—is spectacular, but it’s just one of four major waterfalls in the park. Sprawling and weaving among these woods and waterfalls are 35 miles of well-kept trails that offer something different for everyone. Most of the trails start near the north entrance of the park, near the Betty Dunn Nature Center, which organizes hikes, canoe trips, spelunking adventures, and stargazing outings. Families should have no problem tackling the Woodland Trail, a popular 0.9-mile route that leads from the nature center to the overlook above Fall Creek Falls. Add the Gorge Overlook Trail (a 0.2-mile extension of the Woodland Trail) for a lovely scenic bypass loop that takes hikers past some of the best views in the park, including Cane Creek Falls, Cane Creek Gorge, and Fall Creek Falls from the opposite side of the gorge.